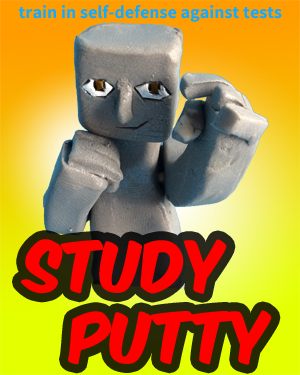 « And…Announcing our Learning Game Contest Winner! 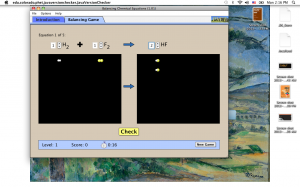 Their Flash simulations provide learning opportunities both for the chemistry classroom and for the student at home struggling to understand a concept. I picked through their catalogue of free chemistry sims in order to review a selection of what they offer. This is, in my opinion, the most practical of the PhET chemistry sims, and by that I mean the most potentially useful to a student preparing to be tested on the sim’s subject matter, in this case stoichiometry. Using an intuitive visualization, this sim makes the mathematics of balancing equations commonsense. If you have two white hydrogen atoms on the left side, then you need two white atoms on the right. There is a practice mode (with additional helpful visualization options) and a timed and scored game mode with three difficulty levels. 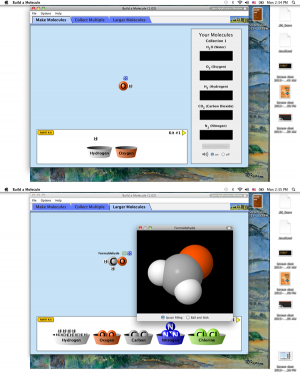 Build a Molecule is another useful basic chem sim. This one helps the student practice concepts related to molecular bonding. You are presented with buckets full of atoms and a list of molecules you need to collect by combining them. You can play two variations of the collecting game, or you can “free build” molecules with no limit on the complexity. A nice touch in all three modes is the 3D viewer that is presented as an option whenever a uncharged molecule is constructed. Other sims follow more along the lines of what most people think of as simulations: they simulate a physical or chemical process. My favorite of this type is Gas Properties, which allows the user to visualize the effects of changes in temperature, volume, pressure, and gravity upon gas behavior. The simulations that seem the most useful to me are those that help one visualize processes that are invisible in daily experience like Gas Properties, while on the other hand the utility of Density, which simulates dropping woodblocks and bricks into water to see what happens, is questionable in my mind. (Spoiler: one floats, the other doesn’t.) Actually, while it doesn’t make a very exciting activity, I can see its usefulness as a lecturing tool. PhET offers about three dozen sims just for chemistry, and other topics include physics, biology, earth sciences, and math. Some of these may be great material to integrate into a lecture, while others could be incorporated into lab activities. Tagged activity, Chemistry, classroom technology, e-learning, educator resources, elearning, learning activities, Learning Technology, online learning, PhET. Bookmark the permalink.